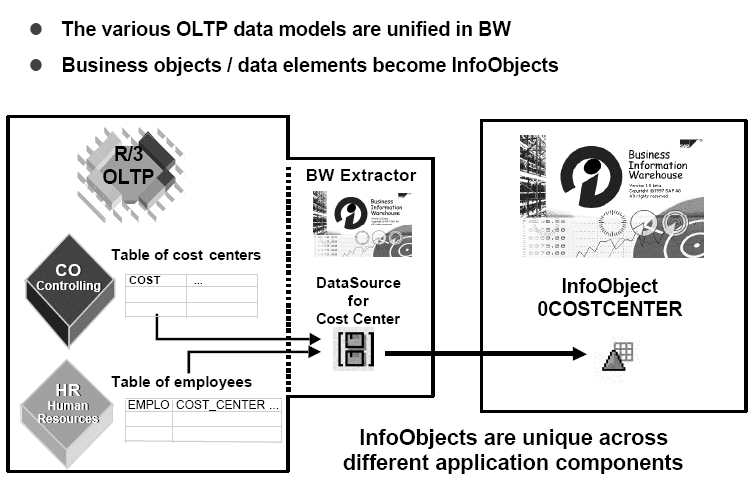 SAP Business Warehouse Data Model is needed in the business scenario as explained below. 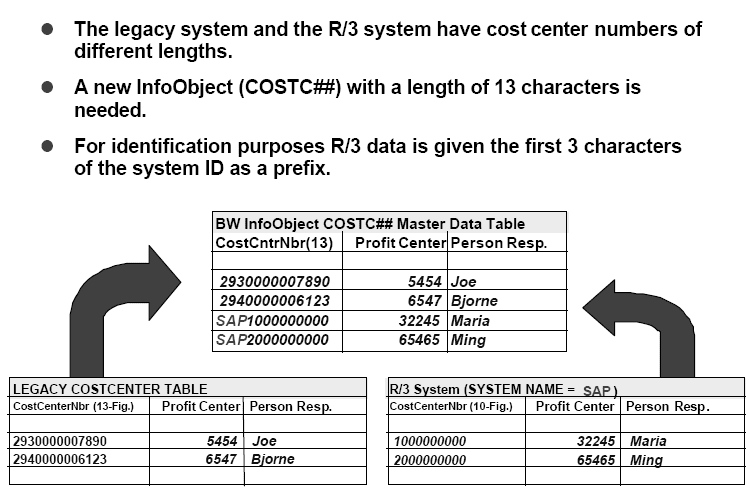 Your company wants to integrate cost center data from an R/3 system and a legacy system.In the legacy system, the cost center number is 13 characters in length compared to 10 characters in R/3. 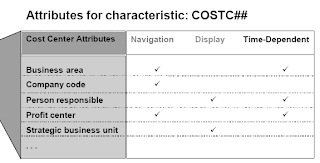 To accommodate this inconsistency you need to create a new InfoObject called COSTC## to represent the 13-character cost center number. 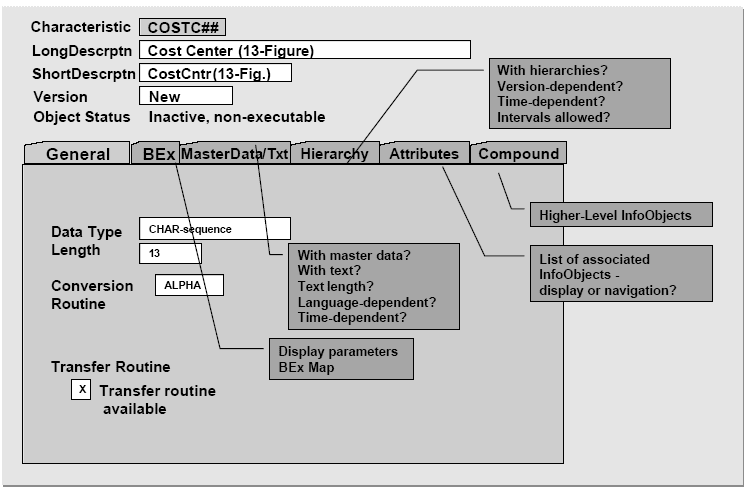 The 3-figure system ID is added to the cost center numbers in R/3.You also need to find out about the extended star schema of the BW data model. fields of a database table. 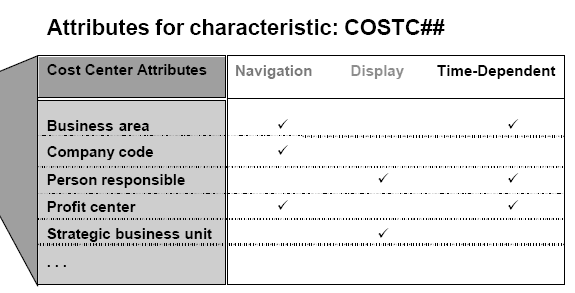 A record in the InfoCube is identified uniquely by the combination of the characteristic values.Characteristics can have compounded key fields. For example, storage location is compounded with plant. This means that the characteristic values for storage location can be interpreted uniquely only in conjunction with those of plant. Characteristics can refer to one another. For example, the characteristics sold-to party and ship-to party can refer to the customer characteristic. This means that all three InfoObjects have identical technical properties and share the same master data tables.The data types CHAR (character), NUMC (numeric character), DATS (date), and TIMS (time) are supported.The valid length for characteristic values is anything between 1 and 60 characters. They are components of an InfoSource. InfoObjects function like the fields in a structure, but they also have additional meta-information.They are similar in design to an InfoCube in that they display characteristics and key figures.They complete an InfoSource by adding master data, text, and hierarchies.You can use InfoObjects in as many different InfoSources and InfoCubes as you need. SAP InfoObjects start with 0. InfoObjects that customers define themselves start with a letter from A to Z. 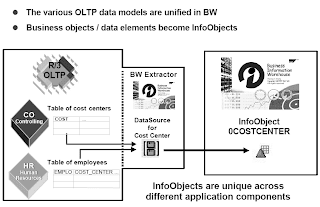 In this scenario we want to combine the overhead cost controlling data from two separate sources into one InfoCube.This is not a problem for the data stored in the R/3 OLTP system, because the InfoObject for cost center already has an R/3 standard length of 10 characters.For the non-R/3 system however, we need to create a new InfoObject to represent the cost center number that has a length of 13 characters.When you create a new InfoObject, you can also make other settings determining which master data, texts, hierarchy characteristics, and attributes you want to assign to the new InfoObject. You select the characteristics for a new InfoObject from a series of tabstrips.These settings have a big influence on the capabilities of the InfoObject and how it is used in BW.These settings also form the metadata for the InfoObjects. They are stored in the metadata repository. Master data attributes are used by the InfoCubes. Attributes are fields that describe master data in more detail. 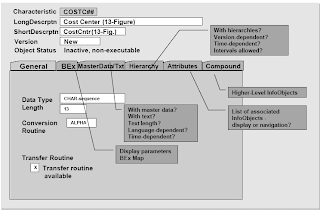 You can use this kind of attribute to display additional information in an Excel workbook to make the results of your reports clearer.You can define attributes as navigation attributes, meaning you determine that during navigation the attributes behave in the same way as dimension characteristics, even though they are not included in the dimension table of the InfoCube that you are analyzing. Attributes that you define as display attributes in the master data table of a characteristic can be displayed as additional information only in combination with this characteristic. You are not able to use a display attribute to navigate in the dataset of an InfoCube. You can set hierarchies as version-specific. This enables users to switch between different versions of a hierarchy when they are reporting.You can make hierarchies and hierarchy structures time-dependent. This means that you can determine the particular time intervals during which the nodes of a hierarchy are valid.